It's an interesting thought, and in this blogger's opinion it's right on the money. The fact of the matter is that trading Drouin means losing a young, promising offensive player. Having another young, promising offensive player in Namestnikov on the roster makes the thought of that loss more palatable, especially if the return for Drouin is reasonably substantial as expected. I'm not saying that a Drouin trade is the best thing for Tampa, just that it might be easier to swallow now than it would have been before Namestnikov decided to go full superhero. What's particularly interesting about this Drouin/Namestnikov talk, though, is the Stamkos connection. From the moment that Drouin was drafted until the moment his trade request went public, Lightning fans salivated at the idea of setting him on the Captain's wing; I've spent a lot of time with this blog backing up the opinion that Drouin deserved a more prominent role, one that involved significant time with 91. That role never came for him, and now it seems like he's all but certainly going to be moved. Ignoring the fact that the Y-axis starts at 40% (shady graphing, Stuart), the reality painted by these numbers is fairly striking. 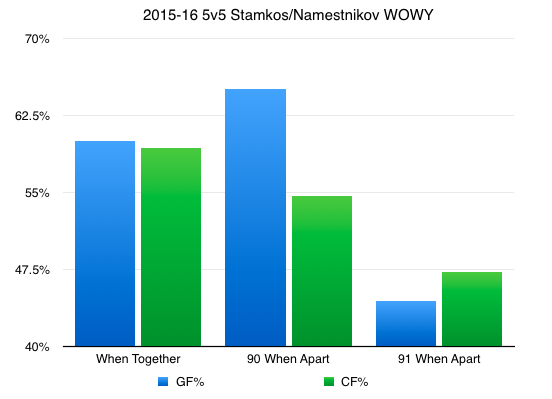 Namestnikov and Stamkos are very, very good together. Both their goals-for and Corsi-for percentages when on the ice together at 5v5 hover around 60%. That's not just good --- it's elite! The 'eye test' has helped us see chemistry between them build on the ice; this chart proves that our eyes haven't been deceiving us. This is a legitimate tandem, worthy of consistent first-line playing time. And the sample size with them together isn't insignificant, either. Stamkos has been Namestnikov's most frequent five-on-five linemate this year, per Stats.HockeyAnalysis.com. The stuff you're seeing in that chart doesn't happen by accident. The bottom line: It looks like the Lightning have something special with this Stamkos/Namestnikov duo, and that makes the idea of losing Drouin a whole lot more palatable than it would have seemed when the season started. 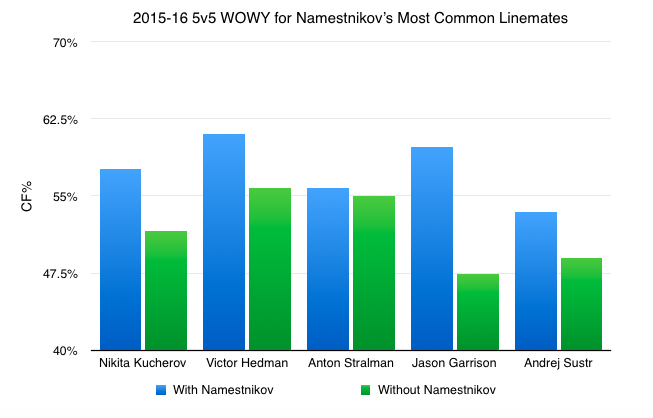 Namestnikov is turning into a guy who can be counted on to drive play up the ice and make his teammates better. He's turning into a guy who helps Stamkos, one of the league's most prolific offensive forces, produce. Guys like that don't grow on trees. The Lightning have themselves a keeper.